My life is usually not so exciting, but last week was quite eventful. I was out sick the entire week, which was quite frustrating due to me already taking one week off in January for the same reason. Despite my cold/flu, I filled my schedule with chicken vegetable soup, stewing over my uselessness at home and bought tickets for two movies that were shown at the Berlin International Film Festival, or Berlinale as it’s known around here. 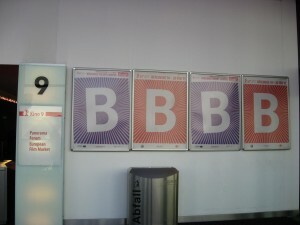 Berlinale posters at the Cubix movie theater at Alexanderplatz. My friend, K, and I decided to see the movie, The Guard, with Don Cheadle and Brendan Gleeson. Verdict? Great black comedy with two amazing actors despite my problems with understanding Brendan Gleeson’s thick Irish accent from time to time. 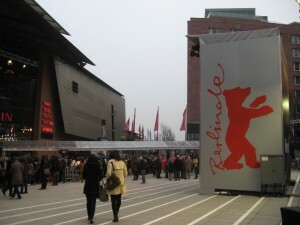 The showing at the Berlinale were American-styled because we bought tickets and the seats were first come, first serve. For those of you unfamiliar with Germany: you buy tickets with the seats already assigned to them when you go watch a movie. No worries–> You choose your seats when purchasing the tickets online or at the counter. There’s a seating chart available too, if you’re wondering. However, there were screenings where tickets had a section assignment, rather than a specific seat. I also bought a ticket to go watch Come Rain, Come Shine, which is a Korean movie that features one of my favorite Korean actors, Hyun Bin. Im Su-jeong (there are a few different romanization spellings of her name, by the way) was the main actress. I bought the ticket for Friday morning at 9:30, which sounds a bit crazy, but it was at the Friedrichstadtpalast, which is an impressive venue. I once watched a show there during my first trip to Germany, and so I decided to return out of nostalgic reasons. Plus, they don’t show movies there, so I figured I might as well go and see how the venue is for movies. The King’s Speech premiered at this venue when Colin Firth was in town. I was too sick to attempt to stalk him. Well…because Hyun Bin is one of my utmost favorite actors, I decided that I would go to his premiere for this movie (he had another movie premiere at the Berlinale, which was actually filmed in Seattle. It’s entitled Late Autumn with Tang Wei as the lead actress). I had read online that he would be at the Berlinale, which is quite important to his fans because he’s due for his mandatory military service in a few weeks’ time. So…I looked up the date and time of the premiere. I found out at the Berlinale Palast, the venue of the premiere, that one can win free tickets for the screening shortly before it began. The crowd of ticket-winner hopefuls was quite small as it is a Korean movie and the actor and actress are not well-known in the Western world. I decided to try for it. 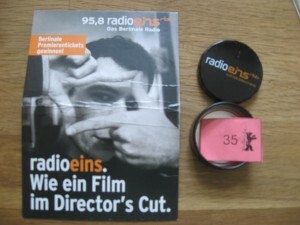 About 40 small tin containers (I think they were originally for mints) were distributed with numbers inside of them, and the contest was courtesy of Radio Eins, a radio station in Berlin. I won two tickets, one of which I had to give away because a friend of mine would not have made it there in time. While I was walking to the entry-way, I heard one loud scream, which probably meant that one of the leading actors were there. Another second scream shortly followed. Sadly, I didn’t see Hyun Bin or Im Su-jeong, but I did get to walk the red carpet in my classy outfit, which consisted of: winter jacket, sporty Puma shoes, my brown purse, mittens and jeans. 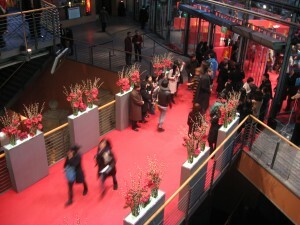 The red carpet stretched into the Berlinale Palast, which I found very interesting. The ticket I received put me at rows 1-9, but because I had to go to the bathroom, I ended up in row 3, which meant my head was resting on the back of my seat the entire time as I watched the movie. But here’s the best part about this whole ordeal, which I had a huge inkling about. What happens at a premiere? 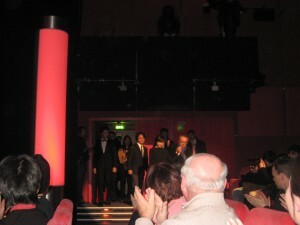 The celebrities walk into the theater to watch the movie, of course. Which means that being in the third row isn’t so bad because at the end of the movie? BOOM! 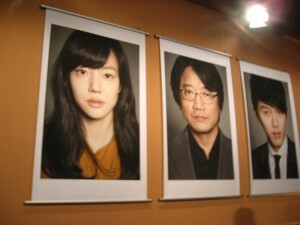 I’m 20 feet away from my celebrity crush, the leading actress and the director, Lee Yoon-ki. Not bad for being sick with the cold/flu, right? I am only too grateful that this happened to me. What were the odds? 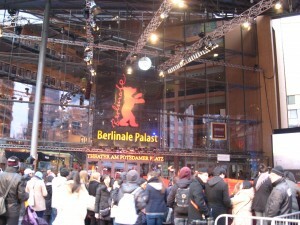 This entry was posted in Jill Nguyen '10, Fulbright to Germany and tagged Berlinale, Sick Week. Bookmark the permalink.